It’s all about selling – drab doesn’t sell. Nothing to do with selling or drab. The original color composite was actually over saturated in the blue 475 nm wavelengths, and so was toned down to look more like what your eye would see at Saturn…more like “true” color. This is what photographers and digital artists do, pretty much everywhere you see a published image of anything. Open up a National Geographic – you’ll see beautiful photos on nearly every page. Every one of them has been retouched somehow. It’s not ridiculous, it’s part of the process. In photography, that’s the deal. Is Saturny even a word? I guess it is now! It’s a combination of three filters anyway . So at least they try to make it beautiful ..
As for “true colors,” the human eye does not capture what might be called true colors. The retina has greater sensitivity to some parts of the optical spectrum over others. Using the electromagnetic irradiance of optical spectra through color filters one can digitally recreate colors. There are of course other elements, such as a CCD and its associated software integrate this irradiance with time, whereas the human eye continually refreshes its perception. This is why nebula and other objects look far more pale than captured images. These images might be the best we get. I doubt that humans are going to be visiting Saturn in the flesh, at least not any time soon. Even if that happens a very few human eyes will see the “true colors” as defined by the behavior of the human eye. 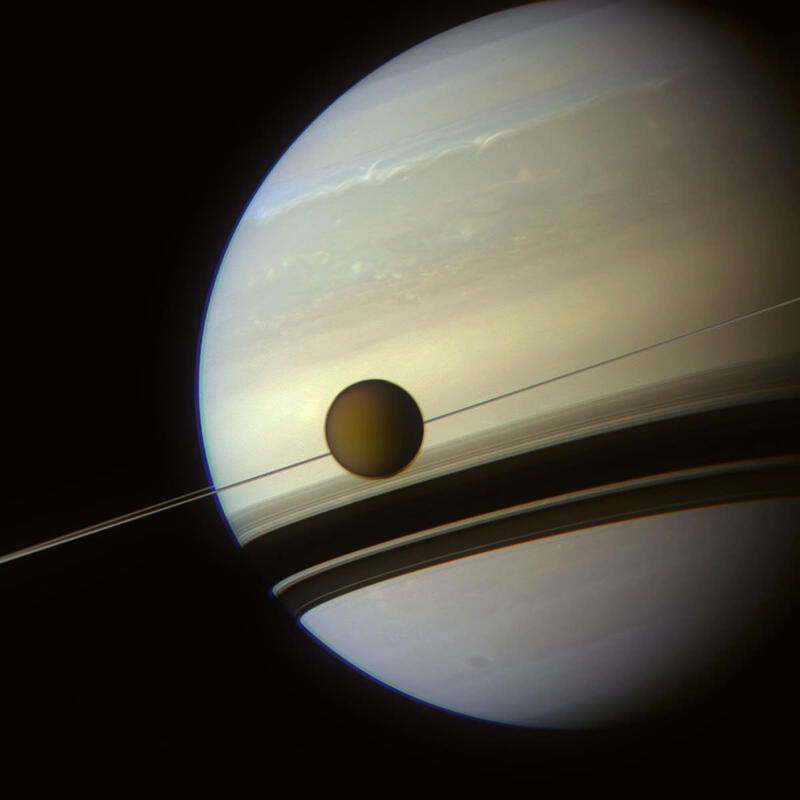 However, if you look back at images decades ago from telescopes looking through the hazy atmosphere, these Cassini images are very remarkable by comparison. Agreed. The images are lovely. The many wonders of creation. More pics of the North Polar Hexagon! The blue layer of Saturn’s atmosphere looks unnaturally thick, it’s > 1000 km on the picture. I suspect this is due to the oversaturated blue-light (475nm) image used in the color composite, as Jason mentions below. That’s due to a slight misalignment of the blue channel. To avoid such color-fringing in Titan, I chose to let Saturn’s limb exhibit some bleed-over. if by “color adjusted” they mean; adjusting the photonic input within each spectral receiver onboard in order to replicate what the human eye would see thats great! If by color adjusted they mean “photoshopped to look more cool” then, come on man/woman, let us get a piece of reality.